1. Combine the ingredients for your shortcrust pastry. Roll out the pastry 1/2 cm (1/4 inch) thick to the shape of the pie dish, allow to relax. Grease dish. Edge the rim of the pie dish with a strip of the pastry. Damp the rim first. 2. Prepare the fruit. If using apples – peel, core and cut into small chunks. Heat the apples on the stove with a tablespoon of water to soften. If using berries, just wash. Place the fruit in a 1/2 liter (1 pint) pie dish. 3. Add the sugar and water and the remainder of the fruit. Place a clove in the pie, if desired, or any other spices like cinnamon. 4. Damp the edge of pastry. 5. Carefully lay the top pastry on the dish without stretching it and firmly seal the rim of the pie. Cut off any surplus pastry. 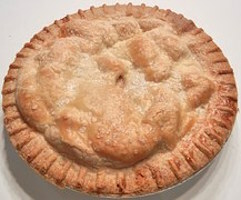 Place the pie on a baking sheet and bake in oven at 450-475 F degrees (230-250 C) for about 10 minutes. 8. Reduce heat and continue cooking for a further 30 minutes. If the pastry colors too quickly, cover with a sheet of paper. ***You can also make individual pies! Bake for 25 minutes.